A new year is, as Queen Oprah says, “another chance for us to get it right.” Resolutions are made, with full intent on accomplishing them, and then tossed aside within a month at best. 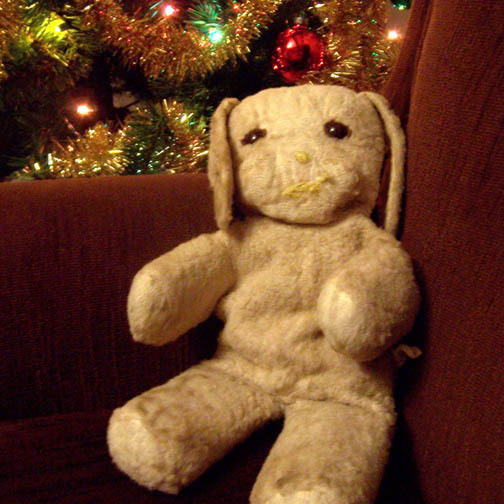 My pal, Sleepy Dog, ventured out of mothballs to celebrate his 47th Christmas. Why do you suppose that is? What is it that makes us slip into our old ratty sneakers instead of trying on a brand new pair of Chucks? Is it because we’re just comfortable? Could it be that simple? Or are we just too lazy and too scared to try something new? We know we should lose weight but what’s one more cupcake going to hurt? We know we should stop smoking but, come on, what’s an occasional puff on the way to work in the morning? Sure, it would be ideal to spend more time on a treadmill and less time in front of the new plasma TV… but, damn, that TV cost a lot of money and I should use it as much as I can! We’re cowards. We’re lazy. We’re afraid of commitment. In other words, we’re human. We constantly believe we really can get around to it tomorrow. Sadly, we don’t always have that “one more day” guarantee. I’ve had more people than I can count come to me with those sentiments. And, just so you know, this concern comes from sitters as well as those in spirit. Hind sight is always sharp and clear but we need to get to the optometrist much earlier. Don’t waste your time making resolutions for the new year. Use your time to really think about what you want to achieve-not for a new year but for a new beginning, a new life, a new philosophy. Do you really want to exercise and eat right? Do you want to find a fulfilling career instead of just tolerating a job? Do you want to find love? Do you want this, that and the other? Then, as the shoe says, JUST DO IT! Oh, sure, we give it a shot for a few days or even weeks. But if you want change-true dye in the wool change-then you must stick with it. Change your routines and thought patterns. You need to take a new route, plan a different journey with a different map. If you keep doing the same things and the same things keep happening… well, you’ll stay right where you are at a blinding rate. Happy New Year, kids. Cheers!